The new-look Washington Capitals are certainly getting things done. And for the second time in as many games trade deadline pick-up Jason Arnott was the key to the Caps victory. The Capitals controlled the play early on, outshooting St. Louis five-to-one at the eight minute mark of the contest. However, it was the Blues who struck first as Alexander Steen converted on a three-on-two odd man rush at 11:25. Late in the first period, the teams began to ramp-up the physical play as Matt Bradley and Tyson Strachan dropped the gloves. Bradley ended the bout with a bang as he delivered three straight right hooks to Strachan’s noggin, sending him down to ice. 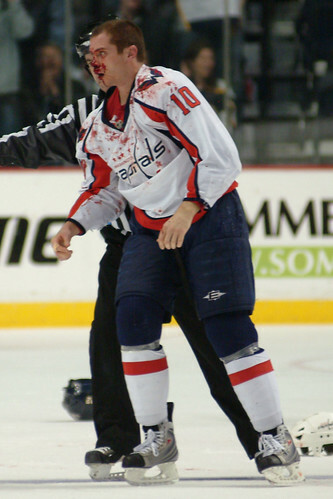 Brads gets an entire post dedicated to this awesome first period knockout of Tyson Strachan because 90% of his fights he ends up looking like this. S/T to @ProffessorBrads. Tonight the Washington Capitals had their first chance to exact vengeance on Jaroslav Halak since he shut the Caps down in the playoffs. Now suiting up with the St. Louis Blues, Halak is the most foreboding embodiment of the Capitals’ postseason woes besides perhaps the Caps themselves. In an uneven effort, the Caps managed to exorcise- at least partially- those Halak-faced demons. But the big story was Semyon Varlamov, who padded his highlight reel with some improbable, firecracker saves. Brooks Laich scored a PPG on the Caps second shot of the night, a high puck right up in Halak’s face. Boyd Gordon recorded his first tally of the year by Jedi-mind-tricking Halak to bobble the puck in himself for the second time this year. The Blues woke up with a screened spin-shot from Alexander Steen that Varly never saw coming. In the third period, Knuble and Backstrom swapped roles: near the paint, 19 converted the rebound off 22’s high-slot slapshot. In the final minute, with the Blues net abdicated, Alex Ovechkin gave Nick Backstrom the empty-net goal layup. Caps beat Blues 4-1. Conventional wisdom around the blogosphere was that the Capitals’ offseason needs included a second-line center and shutdown defenseman. So tonight it was a bit of a shock when it was announced that the Caps acquired rugged right wing D.J. King from the St. Louis Blues in exchange for prospect Stefan Della Rovere. It’s a curious move, one that comes in response to coincidentally coincides with Max Talbot calling Alex Ovechkin a “real douche”.